An Assateague pony recently gave a lifeguard a very rude reminder that that the island belonged to him, not the humans. 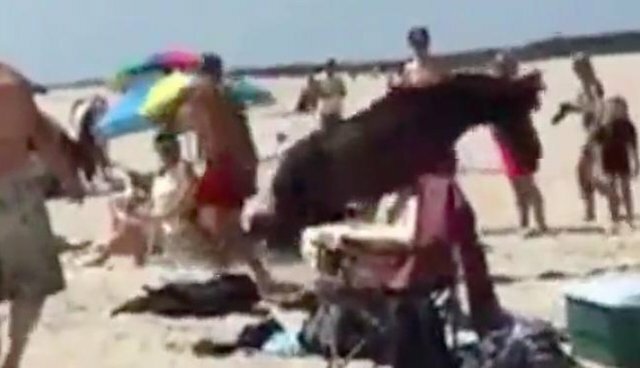 In a video posted to Facebook by park officials, a brown pony can be seen nuzzling through some beachgoers' belongings. A lifeguard approaches him, clapping a pair of flippers together in an attempt to scare him off. But the pony's not having it. As the lifeguard walks away, the pony quickly spins around and kicks him in the chest, striking him repeatedly as he tumbles backwards a good 10 feet into the sand. Assateague, a small island off the coasts of Maryland and Virginia, is famous for its resident herd of feral horses - local folklore holds that they're the survivors of a Spanish shipwreck. The island has been preserved as federal parks and left largely to ponies like this one (though each year the people of neighboring Chincoteague Island round up the ponies for their annual swim to Chincoteague, where some of them are auctioned off). The horses, commonly known as Chincoteague ponies, were also immortalized in Marguerite Henry's children's novel series, Misty of Chincoteague. As this video shows, when humans visit Assateague, the ponies are in charge - and they're allowed to be as wild as they like. In its post, Assateague Island National Seashore reminds visitors to keep food secured, and to give the animals their space. "The human/horse interaction that was captured here over the weekend is a stark reminder of the power and unpredictability of wild horses," the park wrote, noting that the lifeguard walked away with minor abrasions. "Regardless of your comfort level around horses remember that the wild horses are powerful, unpredictable animals."